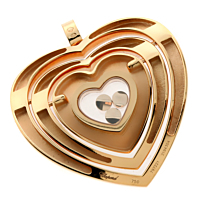 A beautiful rose gold heart necklace from Chopard's Happy Diamond collection. 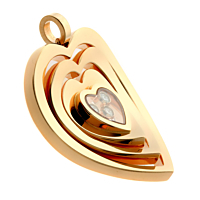 Three high polished, 18kt rose gold hearts are nestled together with a slight curved shape. The center is adorned with a smaller heart featuring three round brilliant cut (.15ct) floating diamonds. The back is hallmarked with the Chopard logo and unique serial number.